For over fifty years, the initials "DS" have been the trusted mark of Certina timepieces equipped with the company's world-renowned Double Security Concept. The new Certina DS1 Automatic maintains this worthy tradition, bringing a distinctly original and modern feel to a vigorous, trusted design. Classic and undeniably elegant, the new DS1 boasts new styling, while retaining the brilliant technological attributes of the early 60s model, a trusted companion to many international explorers. In 1959, Certina launched its DS "Double Security" concept, a revolutionary system that integrated a shock-resistant assembly, reinforced case and sapphire crystal, along with hermetic seals on the stem, crown and reinforced case back. With a Swiss team, the first DS-equipped Certina travelled to the top of Mount Dhaulagiri (Himalayas) in 1960, and successfully demonstrated the extreme resistance of the timepiece under the toughest conditions. The new DS1 Automatic extends this early tradition of resistance and durability, while pushing sport-classical design yet another notch higher. Brilliant contrasts of brushed and polished surfaces play over a handsome 39 mm case. Adjacent textures and captivating geometrics bring sophistication and a light retro touch to an open, expressive anthracite dial and nickelled hands protected by a beautiful, rounded sapphire crystal with anti-reflection coating. 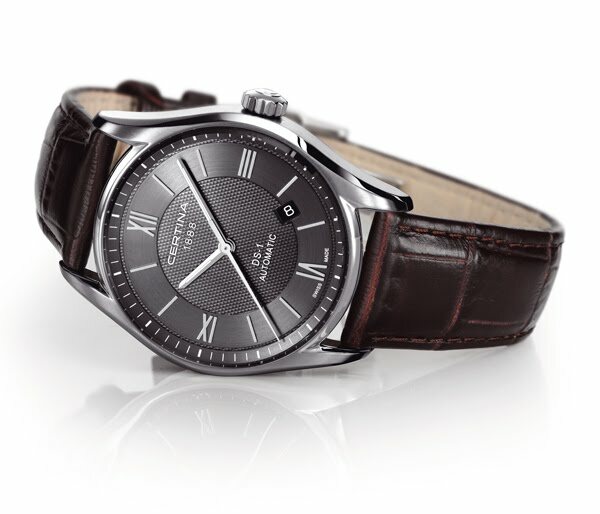 A textured central disk gives the dial a sporty, modern touch, while a broad satin-finished band, at a slight angle, carries Roman numerals that give the DS1 a lightly classical feel; bold, innovative design to make the DS1 Automatic equally at ease in any part of your wardrobe—against a serious business suit, a leisure outfit or sporty leathers. To ensure the greatest legibility under all circumstances, HM hands and hour markings on the dial's outermost rim are treated with Superluminova, and a date window is placed at a comfortable angle, between 4 and 5 o'clock. The DS1 is of course equipped with CERTINA's famous DS Concept, to make it water-resistant up to a pressure of 10 bar (100 m). In a subtle wink back at history, the crown tip carries a Certina logo from the early years, while the see-through case back allows timepiece lovers to appreciate the technological magic at the heart of the DS1. A croco-finish brown leather strap and its twin-push-button folding buckle give the DS1 a delightful finishing touch and unique, unmistakable style. A silver-dial model is also available, with rose-gold PVD indices and hands.